If it’s your job to ensure that a hospital or NHS trust has adequate access control, then you’ll understand how challenging it can be to properly control the movement of people on a tight budget. There are many different types of access control products available on the market that can help restrict public and staff access within buildings. Some products are more sophisticated – and therefore more expensive than others, and some require specialist skills to install, which can also increase cost. When choosing the best products to use, if possible you should look beyond the original purchase and installation costs. Consider the cost of the ongoing maintenance and ask how easy it would be to extend the access control to more doors at a later date. Traditional locks and keys offer a good level security, but can become difficult to manage in a building that has a large number of doors and employees. Keys have to be cut and issued to the correct staff members, doors need to be unlocked and locked on a daily basis, all taking time and money to manage on a large scale. In a building where there is high footfall, this solution doesn’t offer much flexibility or convenience. One solution is to install digital keypad locks as they can provide a greater level of functionality over traditional locks and keys. Access is achieved by punching in a code on the keypad. If you don’t have the code, you can’t get through the door. Unlike card-based entry systems that have to be ‘wired in’ to provide both power and communications to the door, digital keypad locks are battery operated and can be easily added one door at a time with the minimal disruption. There are two different types of push-button door locks available: mechanical and electronic. A basic mechanical door lock can cost anything upwards of £30, whereas a top of the range electronic door lock can cost several hundred pounds. Before deciding which lock is best for your application, you need to consider where the lock will be used and how often the access code will need to change. If you need to secure a linen store cupboard for example, where only a handful of people will need the access code, then a mechanical door lock would be sufficient. To change the access code on a mechanical door lock, you have to remove the lock from the door. If the code doesn’t need changing very often, then this may not be a problem. 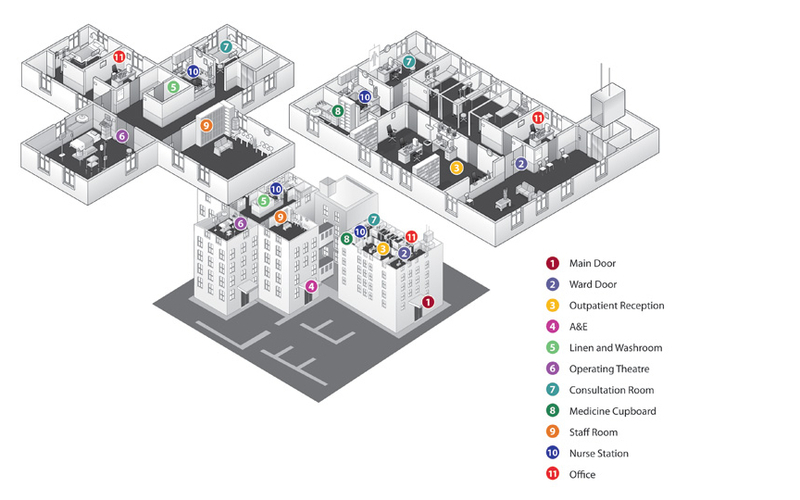 However, if the door provides access to a ward area, where many more people will require the code, it will be more important to make regular access code changes for security reasons. In this case an electronic door lock would be the more secure and convenient choice. Access codes on an electronic digital door lock can be programmed quickly via the keypad while the lock is still on the door. For help with the exact specification of the digital door lock, here are some more guidance questions. There are many areas within hospital or NHS trust buildings that can be given instant access protection with keyless entry door locks. As well as main access routes, you may want to consider consulting rooms, reception areas, cleaning cupboards, staff rooms, washrooms, operating theatres, areas used to store drugs and medical equipment, and offices. For more details on our full range of coded door locks visit our website or call our technical support team on 0800 393405 who will be happy to talk to you about specific requirements.